Ultra-live, retro acoustic drum loops for rock, pop or bluesy-rock (think anything 60’s), Classic Backbeats I offer 1.3 GB of multiple drum styles and tempos as well a pure, punchy sound that simply makes it a “must have” retro drum tool for anyone needing the pure unadulterated tones of an acoustic drum set. Looking for a pure, open, and honest drum sound? The kind that used to drive the classic rock n roll records back in the day? Then, let Classic Backbeats I bring home the purest acoustic drum loops your DAW or sampler will ever know. Classic Backbeats I is a versatile collection of live drum loops and drum fills that capture the live sounds of an all-maple DW drum kit played in a spacious and warm room. If you want ultra-live, retro acoustic drum loops for rock, pop, surf, or bluesy-rock (think anything 60’s), then look no further. 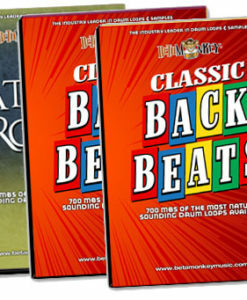 Classic Backbeats I provides thorough coverage of tempos, and a pure, punchy sound that simply makes it a “must have” tool for anyone needing the pure unadulterated tones of an acoustic drum set. 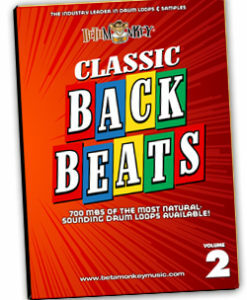 Classic Backbeats I is no lightweight collection offering a handful of useful loops. WIth 1.3 GB of total live studio drum loops, all arranged and organized by tempo, you will have one of the largest drum sample collections we offer on call 24/7 for all your songwriting needs. With grooves covering 12/8 feels, swing feels, straight-ahead rock, and acoustic Hot Rod grooves, Classic Backbeats I will allow you to create any number of stylized drum tracks. 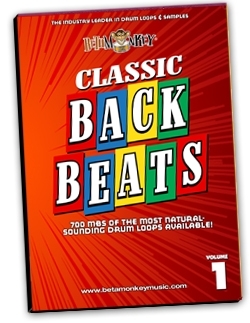 Classic Backbeats I features “Sonically Matched” Retro Grooves: All drum loops are from the same recording session and drumkit which assures you of the best flexibility in mixing and matching loops – everything will match sonically. Like to change up tempos, bump the tempos up a bit in the choruses or solo sections, or mix feels? Classic Backbeats I has you covered. Full Range of Vintage Rock and Pop Drum Styles: Comprehensive Groove Sets™ ranging from 55 bpm to 190 bpm. Straight-ahead rock grooves, laid-back cross-stick patterns, tom grooves and multiple fill variations throughout each groove folder. Cohesive Drum Sounds: All drum loops are taken from the SAME recording session (all grooves, fills, one shots, etc. are sonically-matched). Like to change tempos or time signatures? You can mix any loop with anything else on the disc. The bottom line here is maximum versatility. Fully-Sampled Drum and Cymbal Samples: Customize the loops or create custom grooves with a complete multi-velocity sample collection of all the drums and cymbals recorded for the Classic Backbeats I sessions. Session 1: 678 MB of drum grooves and fills spanning 55-105 BPM tempo range. Session 2: 621 MB of grooves and fills ranging from 110 BPM to 190 BPM. Multi-velocity drum and cymbal samples. ALL ACIDized WAV, APPLE, and REX2 formats are included in digital download or DVD purchases. The way drums used to sound before digital workstations and beat detective! Weighing in at nearly 2 GB, you get all the vintage beats you've searched for: rock n roll, surf, Motown, and British Invasion. Nothing but 100% live and purely acoustic drum loops, all captured to tape and ready to inspire you to play a bit more how they used to! If you're after the grooves of yesterday, then you'll love the grooves we've pulled together for this retro loop bundle set.